Achieve superior protection for documents, photos, or other important materials with our heavyweight clear document protector sleeves. Available in a pack of 100 sheet protectors, these clear plastic page protectors help you protect individual pages from dirt, debris, liquid and other contaminants while ensuring excellent readability to the materials inside. Each sheet protector is perfectly sized to hold letter-size documents in any standard three-ring binder without punching holes and damaging the inserted materials. Each page is designed to hold between 8-12 sheets of paper for added capacity and project flexibility. 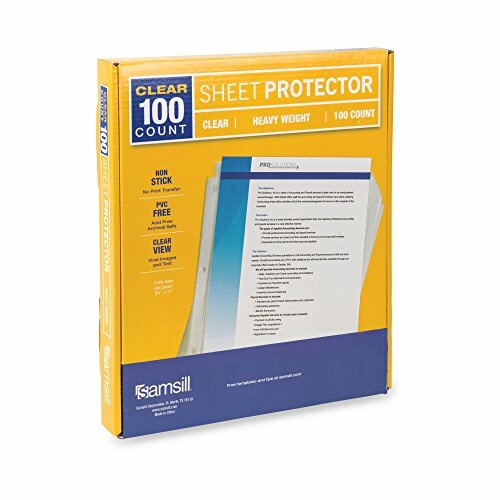 Samsill heavy duty page protectors are made of durable and high-quality PVC-free, non-stick polypropylene material that keeps your valued documents safe and organized in a busy work, home, or school environment. Not only they remain protected from spills, dirt and smudges, the clear polished finish also maintains a crisp and clear view of the content inside. The acid-free and archival safe polypropylene will not lift or transfer ink or photocopy in any way. Each heavy-duty sheet protector meets industry standards and measures 3.3 mil or .084mm thick to ensure superior performance and strength, and can hold paper up to 8.5" x 11". The professional clear protective sheets feature top-loading orientation that allows quick adding or removing of documents. All the sheet protector's feature three pre-punched holes at the edge to allow easy storage and organization without the stress of punching holes in documents before loading. They can easily fit into any 3-ring binder. SUPERIOR PROTECTION - 3.3 mil or .084mm thick polypropylene provides optimum performance and each sheet protector is designed for durability and frequent daily use at home, school, or office. CRYSTAL CLEAR VISIBILITY - All the sheet protectors have clear finish that provide optimum clarity for easy viewing of the documents, photographs, or presentations stored inside. WON'T LIFT OR TRANSFER INK - PVC free, acid free, and archival sheet protectors are mare with non-stick material and will not lift copy from important documents or transfer ink to the sheet protector. EXTRA SHEET CAPACITY - Each document sheet protector can hold 8-12 sheets of paper depending on paper thickness. PROFESSIONAL LOOK AND FEEL - The clear view finish and heavy duty feel provide a premium product that is perfect for portfolios, presentations, and promotional materials.